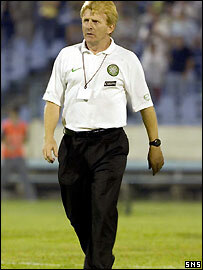 Celtic manager Gordon Strachan described the 5-0 Champions League defeat by Artmedia as "the worst night of my footballing life". "I'm still in shock. I didn't see that happening after half an hour. None of those players will ever forget that performance," he added. "It's asking for a lot (to qualify). At 2-0 I thought we were all right, but we had a couple of chances we didn't take. "Then we gambled with three up front and it didn't work for us." Strachan admitted the excuse that it was Celtic's first competitive game of the season would not wash.
"Their good players were sharper than ours, but I can't say anything to make the fans feel better right now," he continued. "We've just got to suffer together. Whether we need a complete overhaul, we'll see over the next couple of weeks, but we have to analyse that game to see where we went wrong. "Embarrassment is the strongest emotion right now and it's difficult to look anyone in the eye." Artmedia coach Vladimir Weiss admitted he was surprised by the scoreline. "This is a wonderful dream, but fortunately it's reality," he said. "We performed in an excellent way but the way in which we won was a bit of a surprise. "We believed before the game that - with the ability we have and with what I have seen of Celtic - we could win. "5-0 is an excellent result but we believed in our strengths and that anything can happen. We believed we could do anything if we pushed forward. "But it was not easy to win this way. A lot of the Celtic players are media stars but I hope they remember our name and the names of the players after tonight."